Vaidya Mishra likes to say that if his father had to choose one herb that would be his #1 favorite herb in Ayurveda, guduchi would be it. When you start to study this divya aushadhi (divine plant), it is easy to see why it has been the long standing favorite in Vaidya Mishra’s family tradition of Ayurveda. As the story goes, guduchi is full of amritam (nectar of the gods). It is even called amritavalli (creeper with a lot of amrit). The way the plant came into being is told in one of India’s great epics, The Ramayana. After Ravana was defeated, Lord Rama saw that a lot of monkeys and bears had been killed during the war. The monkeys and bears had joined Rama to form his army. Rama prayed to Indra, king of the gods and keeper of the amrit (nectar of immortality), to bring the monkeys and bears back to life since they had died helping to reestablish peace on earth. Indra granted this boon and sprinkled amritam (nectar) from the heavens on the dead bodies of the monkeys and bears. Some drops of nectar fell on the monkeys and bears, bringing them back to life, and some drops fell on the earth. Wherever a drop of the nectar fell on the ground, it became the guduchi plant. Guduchi has all the properties of amritam. It is the best rasayana for rejuvenating the body and getting rid of deep rooted imbalances. In fact, it is so full of life that it can grow without any soil or water. 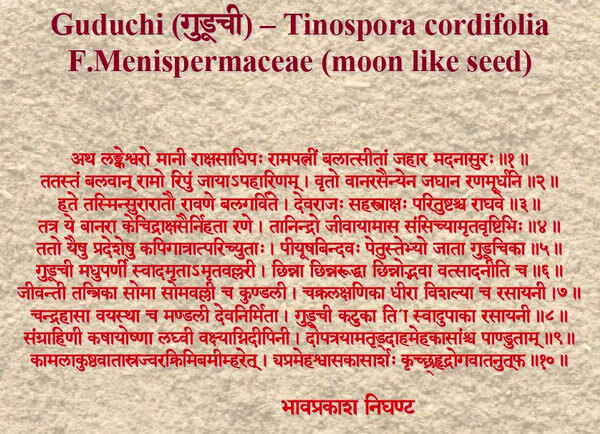 The ancient Ayurvedic text, Bhava Prakash, lists one of guduchi’s names as chinnodbhava (able to grow even after being cut). You can suspend a cutting of guduchi in the air with no access to water or soil and it will grow leaves and branches as if it were connected to the ground. Vaidya Mishra compares this to the ability of certain saints and rishis (seers) who don’t need water or food. They have what is called the amrit siddhi (ability to live purely on vibrational energy). These saints get all the prana (soma, agni and marut) from the air, the sun, the moon, and the vibrational intelligence of the environment. There are three plants which have amrit (nectar of the gods) in them, according to Ayurveda. One is guduchi. The other two are garlic and haritaki. The story of garlic is that the demon, Rahu, wanted to drink the nectar that the gods always drink so that he would become immortal too. He disguised himself as one of the gods and sat at the table with the others. He managed to take one swallow of the amrit before he was recognized by Lord Vishnu, who promptly cut off his head. His head still lives, separate from his body in the heavens as the shadowy planet Rahu (in Vedic astrology). The lower part of his body also lives as the planet Ketu. These two planets are not really planets, but are the nodes of the moon, and cause the solar and lunar eclipses. When his head was cut off, the blood from Rahu’s neck fell to earth and wherever it landed, garlic began to grow. Garlic does have amrit in it, which is why it has many medicinal properties. But garlic also has demon’s blood, which is why it constricts the nadis (vibrational channels) of the body (preventing clear experience of higher states of consciousness) and kills the friendly bacteria in the gut (allowing the pathogens to flourish). Haritaki, the other herb which has nectar in it, also has a story. In this case, Lord Indra’s chalice spilled a few drops while he was watching the apsaras (fairy goddesses) dance. The drops which hit the earth sprouted haritaki plants. This too is a very medicinal and life-giving herb, but it comes with a bit of heat. In this case, the falling of the drops of amrit to earth is tied to the heating rajo guna (the passion of Lord Indra). When compared to the sattwic intentions of Rama praying to Indra to bring life back to the monkeys and bears, it is easy to see why haritaki does not rank as high as guduchi for its healing power. Guduchi is a very powerful and divine herb. It is called jivanti (life giving) because it can literally give your life back. It is full of soma, and is sometimes even called by the name “soma” or “somavalli” (creeper full of soma). It has what we all lack on this planet today: the divine vibration of soma. Despite its great properties, this herb must be used with care. It not only has the powerful nourishing effect of soma, it also is a powerful detoxifier. It is very much able to detoxify the liver, and if done without proper preparation, can lead to a detox crisis very quickly. Even people who have been detoxifying their livers for a long time with other herbs and good diet, may get blood blisters on the tongue, irritable bowels, acne or other signs of detox crisis when using this powerful herb. It is very important that the channels be open and alkaline and that a good diet has been established for some time. The body should be fairly balanced before using guduchi to release the deeper toxins of the liver and other tissues. Guduchi can clean all the way down to shukra dhatu, which means that it can release some very deep toxins back into the blood. If there is any constipation at all, or if there are no binders in the diet (like okra, tapioca, barley, coriander etc), or if there are no measures in place to purify the kidneys and bladder (with punarnava and gokshura) then the deep toxins released by guduchi can be reabsorbed and circulate to the vital organs or wherever the weak spots are in the body and cause serious problems. One does not open and clean the plumbing in the house without first taking great precaution that nothing will get damaged. Once toxins are released in the body, there is no putting them back. That is why it is vitally important to be very careful when detoxifying the body. Vaidya Mishra highly recommends that you do this only under the direct supervision of a Shaka Vansya Ayurveda practitioner. It is Necessary to Preserve the Pure Vibration of Guduchi When Collecting, Processing, etc. Divine herbs need extra care when they are being grown, harvested, stored, extracted or made into products. If the delicate vibration of these herbs is destroyed, the efficacy of the herbs will be destroyed as well. Divine herbs have physical properties, like any herb, but only a small part of their healing ability comes from the physical properties. The real healing power of divine herbs lies in their divine vibration. This cannot be measured in a laboratory. It is the vibrational nature of the herbs which cleans the vibrational toxins of the body. Guduchi and other divine herbs literally clean the light of the soul. Many companies sell guduchi, and guduchi products. You have to be very careful when choosing a source for divine herbs like guduchi. The pickers must be pure emotionally, spiritually and mentally. The drying must take place where there is no bad vibration. No chemicals, like benzene or hexane or parabens, can be used at any stage of the extraction or preservation process. The slightest contact of a divine herb like guduchi with a synthetic chemical will burn the vibrational energy of the plant and render it nearly useless. Likewise, the liver must be somewhat clean if the physical herb is to be used. The highly acidic toxins of the liver can act in exactly the same way that synthetic chemicals do for a herb like guduchi. If guduchi must be used where someone has a toxic liver, Vaidya Mishra’s Guduchi Herbal Memory Nectar is a way to bypass the liver and protect the divine intelligence of this herb inside the body. Bhava Prakash lists many valuable properties of guduchi. Vaidya Mishra and his family tradition know many many ways to use this plant. Here are a few highlights worth mentioning. You can learn more by listening to Vaidya Mishra’s audio lecture (available for purchase at the top of this page). Guduchi is the one and only Ayurvedic herb which can bind and get rid of both amavisha (reactive toxins generated inside the body) and garavisha (xenobiotics like mercury, pesticides, etc.) and reestablish the intelligence of the body once it removes the toxins. Guduchi is the #1 rasayana (rejuvenative herb) in Ayurveda because it can really reverse aging, support the immune system and detoxify. It has the vayasthapana prabhava (the ability of making a person look youthful). It is described as sangrahani (helping to accumulate healthy dhatus, or tissues). It travels to the gaps, or burners, between the dhatus and helps to increase absorption there. If there is any kashaya (wasting) in any tissue, guduchi helps to build it back. This is partly due to the fact that guduchi not only has lots of soma (nourishing ability) but is also kashaya (astringent), laghu (light), and has an ushna virya (hot thermogenic property). The warmth and lightness, as well as the subtle nature of the plant, allows the soma to penetrate into the deep tissues, and the kashaya guna (astringent quality) allows the soma to be absorbed by the tissues. One other important prabhava (special property) of guduchi is vakshagni dipani. Vaksha means “chest” or “heart” in Sanskrit. Agni means “flame.” Dipani means “strengthening the flame.” Vakshagni dipani means that guduchi strengthens the flame of the heart. Just as there is a pitta governing the heart and emotions (sadhaka pitta), so there is a flame, or burner, in the heart (sadhaka agni or vakshagni). The pitta is the fuel, and the agni is the burner. Guduchi cleans the burner and strengthens the flame that processes all emotional challenges in life. When this flame is strong, no emotional challenge is powerful enough to extinguish it. Depression cannot happen if the sadhaka agni is strong. Anger cannot happen when the vakshagni is strong. When the sadhaka agni is burning brightly, one become spiritually free, as the Bhagavad Gita describes: lipyate na sa papena padmapatramivambhasa (untouched by negativity as a lotus leaf by water). Because guduchi opens the heart in this way, it also indirectly helps the mind by connecting the light of the soul to the mind more easily. This is why it is also called a medhya rasayana (good for the mind). The list is probably infinite, but here are a few of the conditions where guduchi is reported by Bhava Prakash to be helpful: daha (burning), meha (when useful substances like sugar go out through the urine), kas (chronic cough), pandutam (anemia), kamala (chronic jaundice), kushta (skin diseases), vatasrajwara (vata type of fever), krimi (pathogenic bacteria), vamimharet (vomiting due to toxins), krichahridaroga (difficult to cure heart conditions). 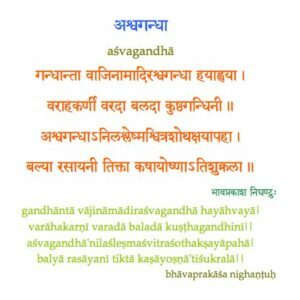 In this 31 minute audio lecture, you will learn directly from the Sanskrit text, Bhava Prakash, about guduchi. 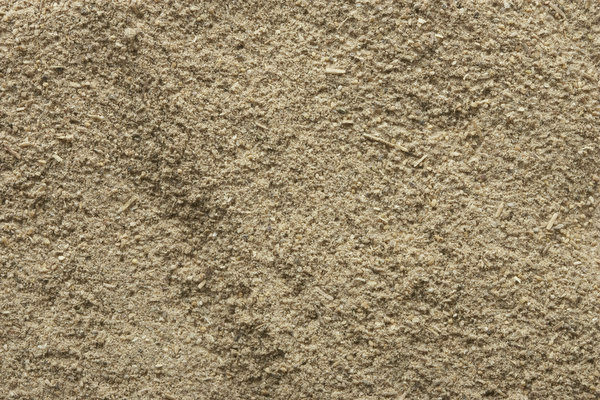 The text, which Vaidya Mishra translates and explains word for word, gives many descriptive names for guduchi, as well a list of physical properties and prabhavas (special properties). 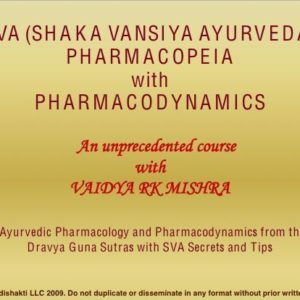 Get your knowledge of the best herb in Ayurveda directly from the source text with Vaidya Mishra. Bypasses the liver, which may be toxic, and delivers the prabhavas (special qualities) of guduchi directly to the tissues. Averts a detox crisis that can be caused by using the crude herb with a person whose liver is full of toxins. 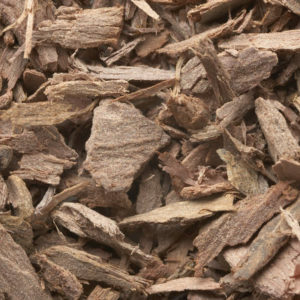 Contains the full power of this rasayana herb. Requires more digestive strength than the Guduchi Herbal Memory Nectar. The liver must be fairly clean before using this herb to avoid a detox crisis. The body must be properly prepared before using this herb.